Fenoprofen Calcium Overdose is the accidental or intentional intake of the drug in dosage higher than prescribed values. What is Fenoprofen Calcium Overdose? Fenoprofen Calcium Overdose may be also referred to as Nalfon Overdose. What are the Causes of Fenoprofen Calcium Overdose? What are the Signs and Symptoms of Fenoprofen Calcium Overdose? The signs and symptoms of Fenoprofen Calcium Overdose can vary from one individual to another. It may be mild in some and severe in others. Several systems of the body, such as the digestive system, nervous system, vascular system, skin and ENT may be affected. How is First Aid administered for Fenoprofen Calcium Overdose? In most cases, the condition is mild and most individuals only require observation and monitoring. 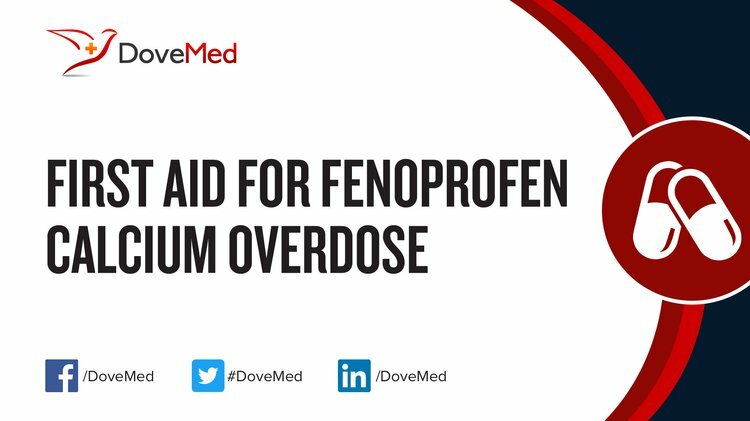 Who should administer First Aid for Fenoprofen Calcium Overdose? First aid for Fenoprofen Calcium Overdose is administered by healthcare professionals. What is the Prognosis of Fenoprofen Calcium Overdose? How can Fenoprofen Calcium Overdose be Prevented? Gumilar, F., Agotegaray, M., Bras, C., Gandini, N. A., Minetti, A., & Quinzani, O. (2012). Anti-nociceptive activity and toxicity evaluation of Cu (II)-fenoprofenate complexes in mice. European journal of pharmacology, 675(1), 32-39. Agotegaray, M., Gumilar, F., Boeris, M., Toso, R., & Minetti, A. (2014). Enhanced analgesic properties and reduced ulcerogenic effect of a mononuclear copper (II) complex with fenoprofen in comparison to the parent drug: promising insights in the treatment of chronic inflammatory diseases. BioMed research international, 2014. Dev, I. K., & Ajmani, A. K. (2015). U.S. Patent Application No. 14/688,398. Kapadia, G. J., Azuine, M. A., Shigeta, Y., Suzuki, N., & Tokuda, H. (2010). Chemopreventive activities of etodolac and oxyphenbutazone against mouse skin carcinogenesis. Bioorganic & medicinal chemistry letters, 20(8), 2546-2548. Pratapwar, A. S., & Sakarkar, D. M. Applications of rosin derivatives in the development of novel drug delivery system (NDDS): a contemporary view. Chemistry, 8, 10. Bushra, R., & Aslam, N. (2010). An overview of clinical pharmacology of ibuprofen. Oman medical journal, 25(3), 155. Babeendran, S., & Soucie, A. C. (2015). Cancer Pain 27. Pain Management and Palliative Care: A Comprehensive Guide, 189.
da Silva, V. H., Vieira, F. S., Rohwedder, J. J., Pasquini, C., & Pereira, C. F. (2017). Multivariate quantification of mebendazole polymorphs by terahertz time domain spectroscopy (THZ-TDS). Analyst, 142(9), 1519-1524.